After making 2 toddler quilts for the Bay Crisis Nursery (a local charity I support), I had a messload of half-square triangles that had been created when the Friendship Star blocks in the toddler quilts were trimmed. Sometimes, the trimmed half-square triangles are really too small to do anything with but these were a decent sized. It just seemed criminal to toss them. During a recent, demented flurry of cleaning, I rediscovered all the half-square triangles. I knew that if I didn't do something with them RIGHT NOW, they would once more disappear into the morass. 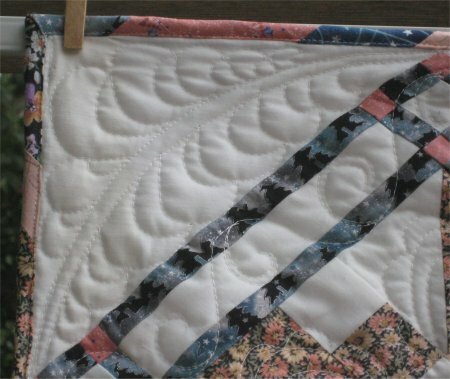 One quilting blog I have read is Studio 78 Notes In that entry, the blogger, Rayna Gillman, talks of rediscovering some orphan antique blocks in her sewing room. I emailed her about them, asking if she knew the name of the block, but she had no idea. She did say that "The pattern looks like something from the Kansas City Star era but who knows? From the fabric, I am guessing 1940's or 50's. Looks to me like some kind of windmill but I don't know the name." I wanted to know for documentation purposes because the block is a perfect vehicle for *me* to use up those half-square triangles. from Frances in TX: I found it! I found it! It's called Propeller. 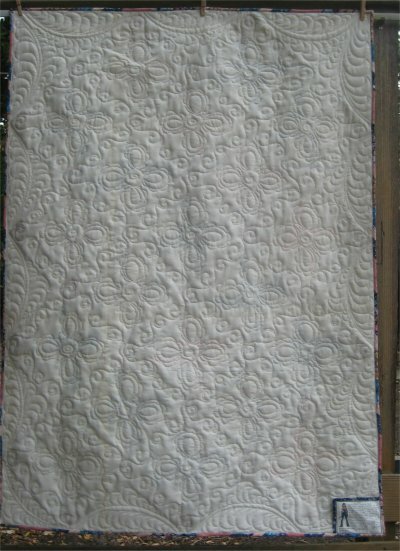 It was in my handi-dandy book called 1000 Great Quilt Blocks by Maggi McCormick Gordon. It was under 5 patches and it said it was a 10" block. 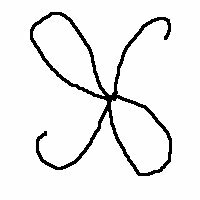 Also, if you make the center square the same color or shade as the 4 surrounding squares, the name changes to Broken Arrow. 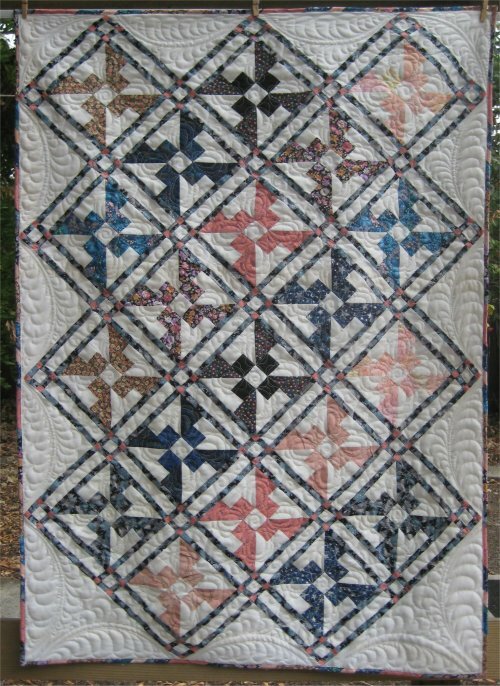 from Donna in OK: According to Barbara Brackman's Encyclopedia of Pieced Quilt Patterns, it is block #1934 on page 244-245. It's called the 'Propeller' published by the Ladies Art Company (their block #506 and would have first been published around 1928) or 'Broken Arrows' published by Quilt World in October of 1979.
from Misha in Snoqualmie Pass, WA: Per my Encyclopedia it has 2 names: Propeller - LAC #508 Broken Arrows - Quilt World October 1979 I like it and think it's a great alternative to a pinwheel (no dealing with eight seams in the center!) Expanding on that, the "LAC" is the Ladies Art Company. I didn't read all of it but it said that the 1897 (yes, eighteen) catalog boasted it had 400 designs, and by 1928 they had 530 designs, so it fell somewhere in between those dates. 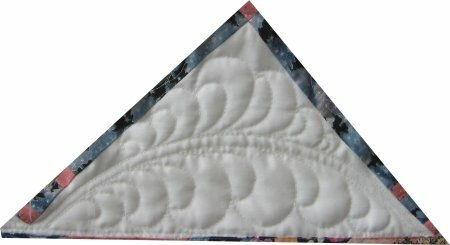 Now that my curiosity was satisfied, I used Electric Quilt to design some quilts using that block. Eventually, I came up with 3 layouts that I liked. It has a layout flaw: I was able to make 20 Propeller blocks from all the half-square triangles. Sadly, the on-point layout needed either 18 or 23. If I used the 18, I'd have 2 blocks leftover. I did not WANT leftover blocks! I also didn't have any more fabric of any of the prints to make more half-square triangles. The 20 Propeller blocks would have worked out nicely (although my layout graphic only shows 15 blocks being used), but I also would need all the alternate Snowball blocks. That would have entailed more decisions about what color the Snowball corners should be (matching? coordinating? contrasting?). I sure didn't have enough matching fabric and was eager to actually sew up the top. I didn't want to spend any more time with design decisions and piecing. This layout has the same problems that Layout 2 presented: I needed more fabric to make the alternate Kaleidoscope blocks. Additionally, my graphic shows 10 Propeller blocks being used; using all 20 in one quilt would have created a VERY long and skinny quilt. 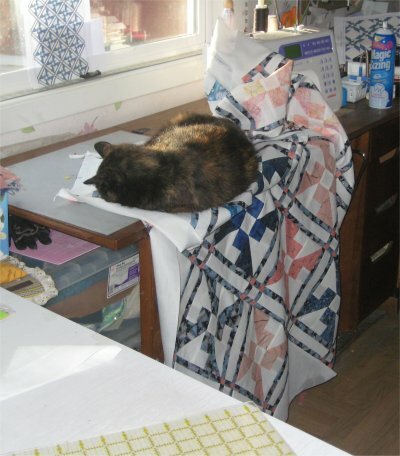 I probably would have ended up making *two* quilts from this layout. I knew I just didn't want to spent that much time on these blocks. I used plain unbleached muslin for the backing. I've been doing that more and more these days. When I began quilting, I somehow got the idea that the backing *needed* to be quilting fabric also. I use a matching thread to the muslin so that what you see is just the texture of the quilting (oh yeah and any mistakes I make are hidden!). So, what to do about the binding? The quilt is basically shades of blue and apricot. There are quite a few different fabrics used in this top and picking one of them for the binding was difficult. I didn't want to particularly emphasize either one by using that color as the binding. What I did instead was to make a humungous strip set from strips of *all* the fabric I had leftover. From that strip set, I made my bias binding. [It's easy ... here's my no-fail tutorial on how to make yards and yards of continuous bias.] I love doing this as the multi-fabric binding coordinates so perfectly with the top! I think I must be a weird quilter: I *love* making bias binding. It's not difficult and you can match *exactly* what's in your top or make your own custom binding from specific fabrics. It doesn't take me long to do. 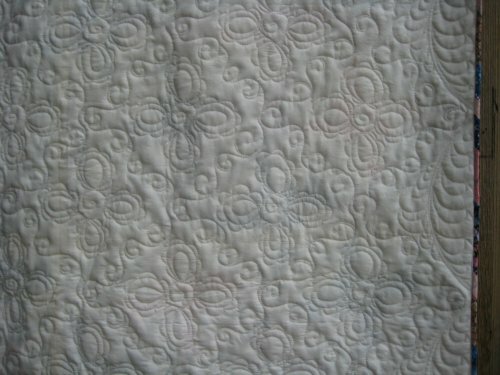 I used Superior's King Tut in the top (color #971, White Linen) and Superior's Bottom Line (color: white) in the bobbin. I like this combination and my Tin Lizzie's tension is absolutely *perfect*. I love my Lizzie. :-) The batting was nothing special; it's just polyester. In fact, it's a *bunch* of large polyester pieces that were leftover from other projects. I joined them together with a muslin strip under the seam. I don't save every piece of leftover batting, but if the pieces are "large enough", I just can't seem to toss them. They eventually get used up. I ended up with a variation of a design I found in "Follow the Line Quilting Designs" by Mary Covey. Her design had two oval designs (diagonally opposing each other) and ribbons in the other 2 quadrants. (The graphic on the left is a simplified version of her lovely design. Go look at her book for the real thing.) But I thought it would leave too much of the Propeller block unquilted. So, I removed the ribbons and just duplicated the oval designs. After drawing it, I realized that these ovals were exactly like some embellished meander designs I had learned from Darlene Epp's books! Soooo ... this would be an easy design for me to do! Setting triangles: I love swags. And since I learned how to do Sally Terry's "Hooked on Feathers", I love hooked feathers. I wanted to do swags in the setting triangles but I didn't have a template large enough for the space. I don't do large curves nicely free-hand and a template is a must for me. What I did have is a hemisphere that was *almost* large enough. Now a hemisphere won't make a swag, but it will make 2 parallel arcs very nicely, so that is what I quilted instead of a swag. It's kind of a pseudo-swag. :-) The hooked feathers were stitched on either side of the arcs. And that leads us to that Layout Flaw I talked about earlier. Remember how the corners were not all the same? This discrepancy determined two completely different quilting designs for the corners. The top row of the quilt has 3 Propeller blocks; this results in a small corner triangle. I couldn't orient the arcs in the same direction as in the setting triangles because it not only wouldn't fit but it wouldn't look good either. Sooooo ... I flipped the arcs. 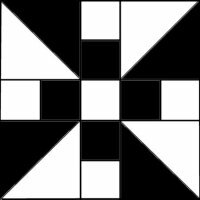 The bottom row of the quilt has 2 Propeller blocks; this results in a LARGE corner triangle. One large arc-and-feather motif would look incredibly out of place BUT two arc-and-feather designs (which would actually be the same size as all the other ones) would fit nicely. Putting ALL the quilting together, you can see everything much better from the back, where the blocks and fabrics aren't distracting. I had contemplated doing a stitch-in-the-ditch around the outer sashings to define them, but ultimately decided against it. When I looked at the back, I was very pleasantly surprised to realize that I didn't need that definition at all. 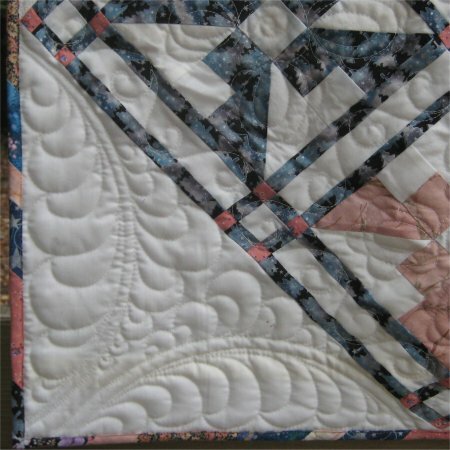 I just LOVE LOVE LOVE the texture of this quilt! When I was piecing it, I was ambivalent about keeping it. The fabrics weren't particularly sentimental to me. I didn't really need a quilt this size (42" x 62", a generous throw). I could give it to the Crisis Nursery that I make toddler quilts for. No quilt is complete with the Quality Control Assurance Officer in attendance.